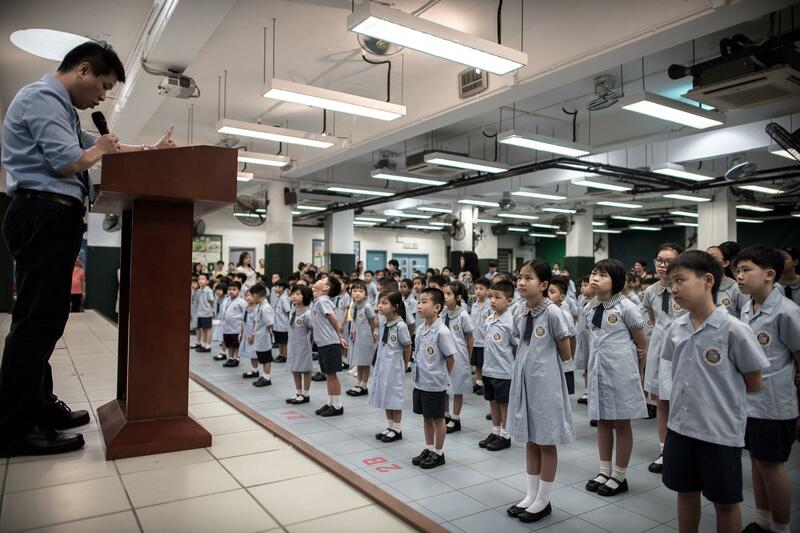 Children stand at attention on the first day of school in Hong Kong in 2015. Education is increasingly becoming a political battleground. Activists protest in Hong Kong in 2012 against legislation to start a "national education" program. 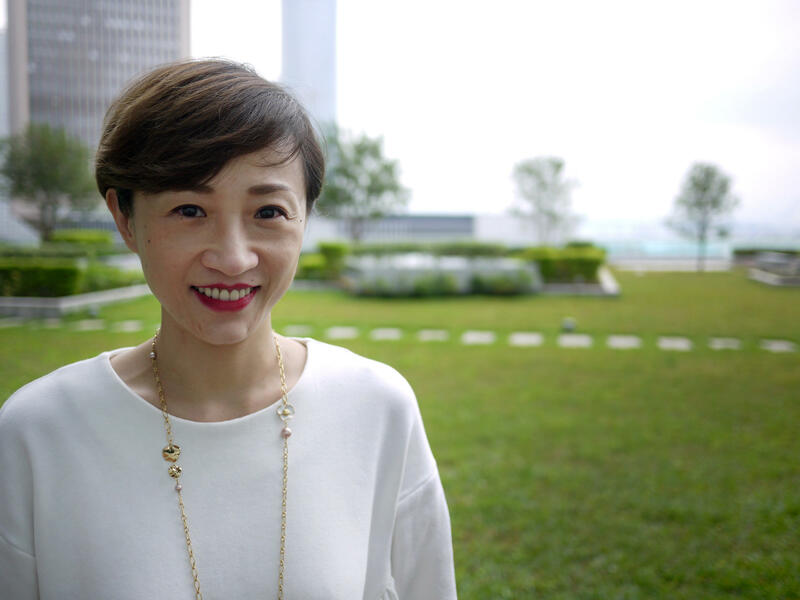 Hong Kong legislator Tanya Chan believes China's push to include the national history curriculum in Hong Kong schools is part of a larger push by Beijing to change how the city is ruled. 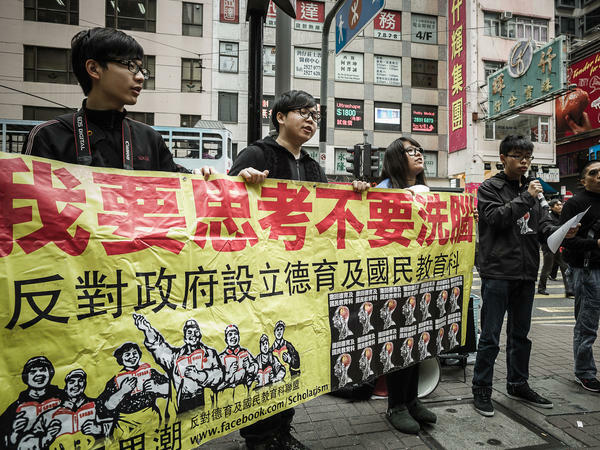 It was the summer of 2012, and the movement to stop Hong Kong's government from introducing China's national education into city schools launched the careers of activists like Joshua Wong, who later became an international celebrity for standing up to Beijing. After protesters besieged government headquarters for 10 straight days, officials backed down. Now the government has returned with a scaled-back plan to change how history is taught in Hong Kong's secondary schools. Teachers, parents and legislators are worried about the changes. The new proposed curriculum for city schools is missing key parts of modern Chinese history, like Hong Kong's 1967 pro-Communist riots against British rulers and the Tiananmen Square massacre of 1989, when Chinese troops killed hundreds of unarmed pro-democracy demonstrators in Beijing. "These are crucial parts of history being taken out," says secondary school history teacher Cheung Siu-Chung. "Teachers are asking what the rationale is behind this, and our own deputy secretary of education said these parts of history are trivial and aren't even worth mentioning. She literally said that." The new proposed history curriculum for Hong Kong would go into effect in two years. It would require Hong Kong schools to spend more time teaching students about China's modern history — from the Communist revolution in 1949 through its transformation to an authoritarian, capitalist powerhouse today. The proposed curriculum carefully removes or skims over events deemed sensitive by China's Communist Party, like Mao Zedong's failed political campaigns that left tens of millions dead, as well as uprisings like Tiananmen, leaving it to teachers to decide whether they'll have time to teach these events. "My only concern is that teachers are very busy in Hong Kong, they have so little teaching time and so much work, so that would be a potential problem," says Hong Kong legislator Alvin Yeung Ngok Kiu. "I don't mind students being taught development and constructions and achievements that modern China has achieved. It's fine. Economically, they have done a great job," Yeung says. "But on the other hand, I expect the students to be taught what happened in the Cultural Revolution and the Tiananmen Square in 1989, so that students have a full picture of what happened." Fellow Hong Kong legislator Tanya Chan says the struggle over education in Hong Kong is the latest battle with China over how the city is governed. "We can see this kind of confrontation will get worse and worse," she says. "But of course at the same time, if we feel more and more vulnerable, then the control from the Chinese government over us will become stronger and stronger." On a weekday afternoon in the Hong Kong neighborhood of Mong Kok, uniformed students stream out of schools for a half-hour of freedom before heading to nighttime cram schools. Timothy Ng is among them. The 17-year-old says history is one of his least favorite classes – too much focus on regurgitation of facts, he complains. He says he learned more about China in literature class when he read George Orwell's dystopian novel 1984. "especially in the Chinese context, where you can see the government is a totalitarian one, and it wants the ability to implement education that is confining our thoughts over some topics." Fellow student Matthew Chu says he and his class were on the verge of a history lesson last year when other students began handing out pamphlets. "They gave some information — about how Hong Kong should be separated from China — in front of our school and give to our students," remembers Chu. "Then the teacher called them to go into a room and talk." When they came out, the students had been disciplined. And that, says Chu, was the last he and his classmates heard about Hong Kong independence at school. He says it was one of the best history lessons he's had. NPR Shanghai bureau assistant Yuhan Xu (@Yuhan_Xu) contributed research to this story. History is written by the winners. So when power is shared, there's often a tug of war over the past. That's what's happening in Hong Kong, which has enjoyed a degree of political autonomy since Great Britain returned control of that city to China 20 years ago. NPR's Rob Schmitz reports on the push to teach the Communist Party's version of history in schools. ROB SCHMITZ, BYLINE: The last time China pressured Hong Kong to scrap its curriculum in favor of one developed by China's Communist Party-led government, this happened. UNIDENTIFIED MAN: (Shouting in foreign language). UNIDENTIFIED CROWD: (Shouting in foreign language). SCHMITZ: In the summer of 2012, tens of thousands marched through the city chanting down with national education. After protesters besieged government headquarters for 10 days, officials backed down. SCHMITZ: But now the government is back with a plan to revamp how history is taught in Hong Kong's secondary schools. History teacher Cheung Siu-Chung says he's worried about the changes. The new curriculum is missing key parts of modern Chinese history, like Hong Kong's 1967 riots between communists and British rulers and the Tiananmen Square massacre of 1989 when Chinese troops killed hundreds of unarmed pro-democracy demonstrators in Beijing. CHEUNG SIU-CHUNG: (Through interpreter) These are crucial parts of history being taken out. Teachers are asking what the rationale is behind this, and our own deputy secretary of education said these parts of history are trivial, so we don't need to teach them. She literally said that. SCHMITZ: The new proposed history curriculum would go into effect in two years. It would require schools to spend more time teaching students about China's modern history from the communist revolution in 1949 through its transformation to an authoritarian capitalist powerhouse today. The curriculum carefully removes or skims over events deemed sensitive by China's Communist Party, like Mao's failed political campaigns that left tens of millions dead, as well as uprisings like Tiananmen, leaving it to teachers to decide whether they'll have the time to teach these events. Hong Kong legislator Alvin Yeung is afraid teachers won't. ALVIN YEUNG NGOK KIU: I don't mind students being taught the developments and constructions and the achievements modern China has achieved. It's fine. Economically, they have done a great job, but on the other hand, I expect the students to be taught on what happened in the Cultural Revolution and also Tiananmen Square in 1989. SCHMITZ: Fellow Hong Kong legislator Tanya Chan says the struggle over education in Hong Kong is the latest battle with China over how the city is governed. TANYA CHAN: These kind of confrontation will get worse and worse. But of course, at the same time, if we feel more and more vulnerable, than the control from the Chinese government over us will become stronger and stronger. SCHMITZ: On a weekday afternoon in the Hong Kong neighborhood of Mong Kok, uniformed students stream out of schools for a half hour of freedom before heading to nighttime cram schools. Timothy Ng is among them. The 17-year-old says history is one of his least favorite classes - too much focus on regurgitation of facts. He says he learned more about China in literature class when he read George Orwell's dystopian novel "1984." TIMOTHY NG: So basically it's a very good reflection of the modern society we are having today, especially in the Chinese context. SCHMITZ: Fellow student Matthew Chu says he and his class were on the verge of a history lesson last year when fellow students began handing out pamphlets. MATTHEW CHU: They gave some information about Hong Kong should be separated from China in front of our school and give to our students. And then the teacher called them to go into a room and then talk. SCHMITZ: When they came out of the room, the students had been disciplined. And that, says Chu, was the last he and his classmates heard about Hong Kong independence at school. He says it was one of the best history lessons he's had. Rob Schmitz, NPR News, Hong Kong. (SOUNDBITE OF KIASMOS' "LIT") Transcript provided by NPR, Copyright NPR.